I'm, sort of, the self appointed expert on Hans Larsen here in Norway and have some 50 of these in my collection. I've seen a lot of Larsen tennstempel rifles, but have never seen exactly this version and never one that seems this 'unfinished'. The wood seems to be stained flamed birch that Mr. Larsen used a lot, but there are a number of 'but's'. Larsen used sliders and not bands in the late '60's and early '70's. There are no traces of sliders been used. This mechanism is from between 1866 and 1875. The rear sight is just nonsense. The cleaning rod is all wrong. The lock lookes a bit too tall and a bit too short and the crank way too short. Most important, I've never seen a Larsen rifle marked like this. My very rough guess is that this might be the work to obtain an apprentice title by one of his employees. 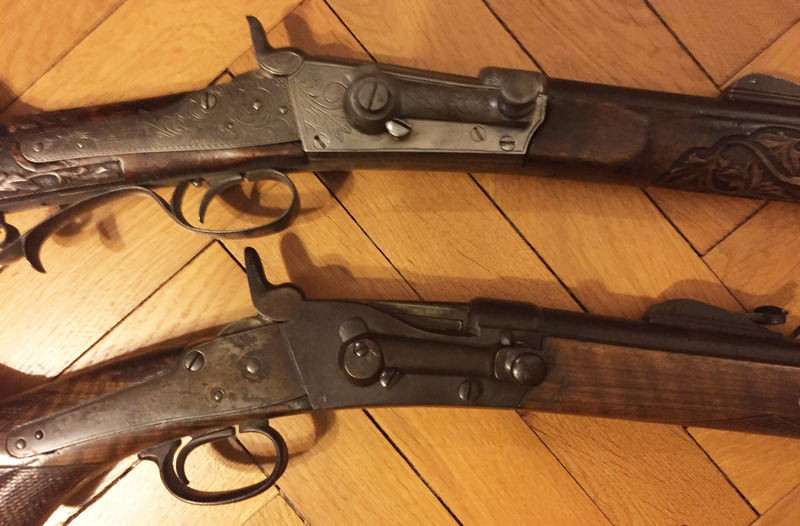 The picture shows two Larsen tennstempel rifles from around 1865-70. The one you have, looks a lot like the bottom one, but is not identical.